Does your interior decorating style lean towards the traditional? 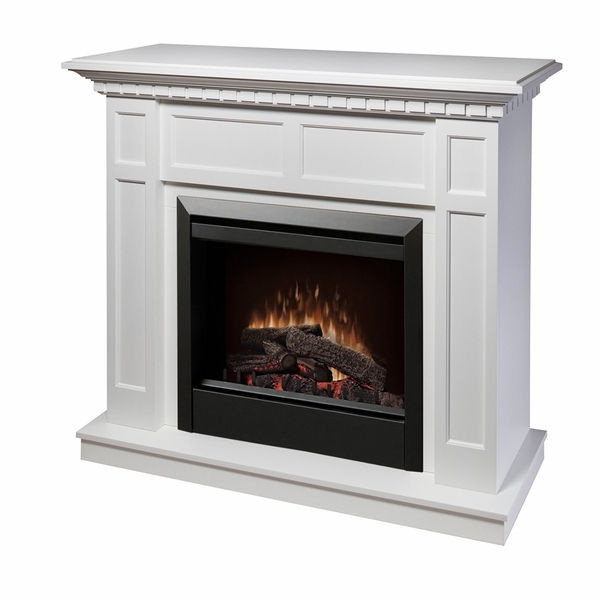 If you are in the market for a new fireplace to complement your already elegant decor or to create a fresh aesthetic for your home, consider this Caprice fireplace package from Dimplex. 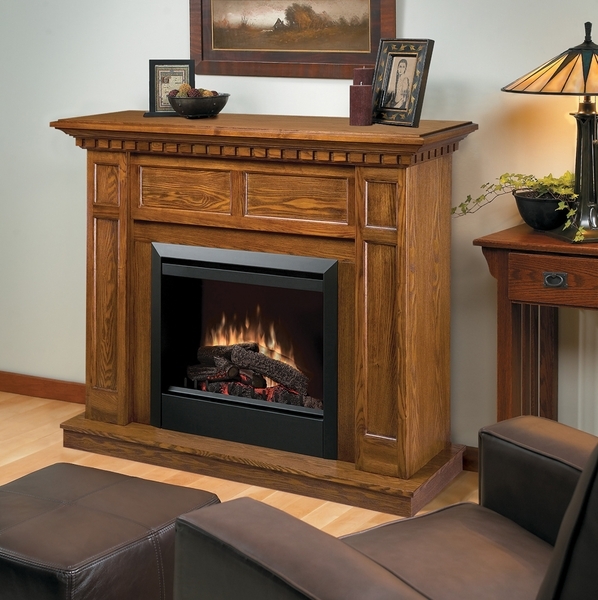 As with all Dimplex products, this fireplace gives you top of the line efficiency, style, and even environmental safety. It is available in either a warm oak or white finish, so you can customize its appearance to further fit your decor and color scheme. This fireplace heats an area of up to 400 sq. feet and includes an on/off remote control for your convenience. Is it hard to put the mantel unit together? The mantel is easy to put together. Is the box solid oak? It is not solid oak, no. I bought this fireplace a couple years ago and have replaced the lights just once. Now it will not light but the heat works as does the spinning device. It was suggested to us it might be a fuse but we can't find where a fuse might be located. I can't find my manual to it, either. The service guide and wiring diagram for your unit can be found here. 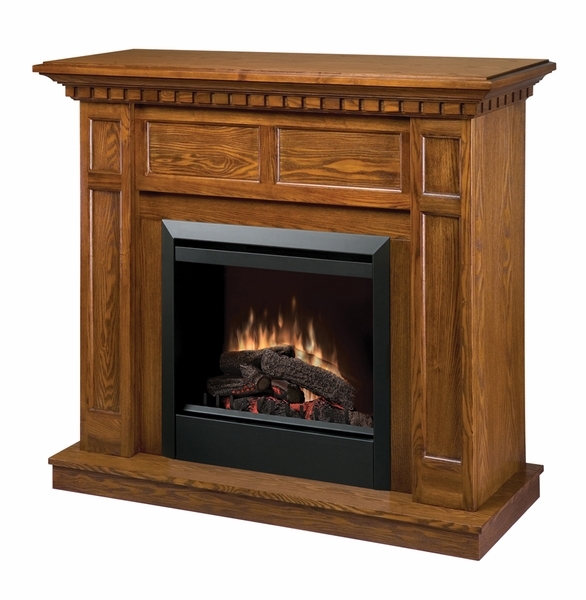 What are the dimensions of this Dimplex DFP4743 Caprice electric fireplace and mantel with log set? This mantel has outside dimensions of 48 1/4" wide, 42" tall and 17" deep. You can see the full illustrated dimensions in this digital brochure. at all with the fireplace or the company. Thank you so much eFireplace Store. I just love this very much! Does not look cheap at all. It takes the chill out from our 12x22 family room. Very easy to assemble as well. I had to do it alone and my husband completed after his work. it is worth the pay. The installation process was not a hassle. I asked help from videos in Youtube. The flush butto sometimes needs to be help for some seconds to flush absolutely. I also asked the help of the customer service with the adjustable tank. It required the removal of some parts before we could adjust it to my preferred setting. It took almost an hour to have all of these process done. Overall, I was satisfied with the product. I like this toiler so much. Words cannot explain how I feel about this unit, since it gave me a lot of happiness. It saves a lot of space in my bathroom. It is easy to clean since its top is flat. I am also pleased on how it matched the taste of tiles. It is too comfortable to use and it is quiet when we close the lid. Nice piece of furniture. Very easy to assemble. Solid, real wood. The flames are incredibly real looking. I was urged to buy this unit due to the call of conserving water. I already bought a Toto one piece dual flush toilet but I also though to give this product a try after reading some good reviews. The installation process took about 45 minutes. I have noticed that the flushing is quiet and effective. It also lessens the use of water due to its unique function. Unlike the Toto toilet, this unit has two big buttons that can easily be pressed during flushing period. It has been months since I installed this and it gave me so much happiness. I gave this product a high recommendation. This is an excellent purchase! It looks real and serves as a great heat source. Very easy to assemble, great design, and looks perfect in any room. I could not be any happier! Before I bought the product, I did a lot of research online, and found out that my cousin had bought one. Right after I purchased one for my condo. It was installed directly into my condo a couple of days after purchasing it and I began to love it. It heats my room jsut enough with the realistic flame that adds attraction to it. Even my cat could not resist the enough warm given by the fireplace. I have given a great recommendation for this product.